CTS will soon carry two lines of lighters, both of which are made by STAR®. STAR® was established in 1988, and is recognized as the largest manufacturer of fluid lighters in China, specializing in the manufacturing of fluid lighters, lighter accessories and displays, as well as it’s own line of lighter fluid. 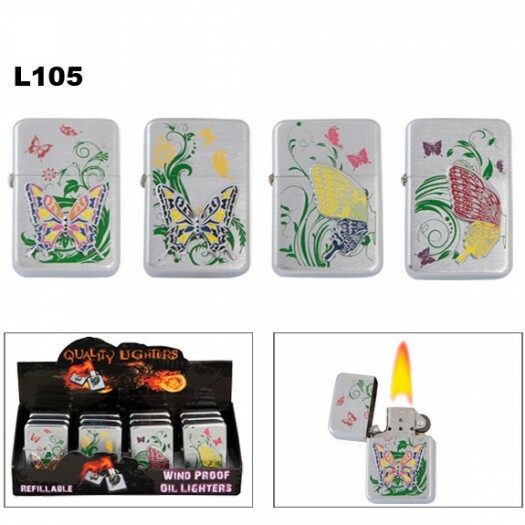 CTS is the leading direct importer of these exceptional lighters. 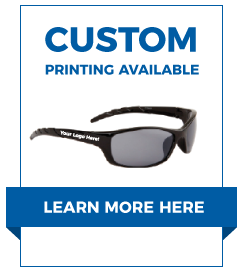 CTS will also be introducing several new finishes that will be available within each series, as well as new engraving techniques on the graphic illustrations. Currently CTS carries the “L” series of lighters. 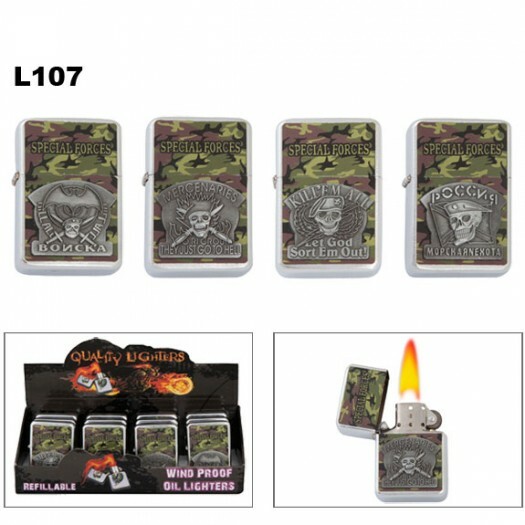 Steel Oil Lighters “L” Series: This series of lighters are made of steel, increasing their overall durability when compared to lower priced metal lighters. Manufactured and quality inspected according to STAR™ QT standards; these wholesale lighters are made to withstand everyday usage. 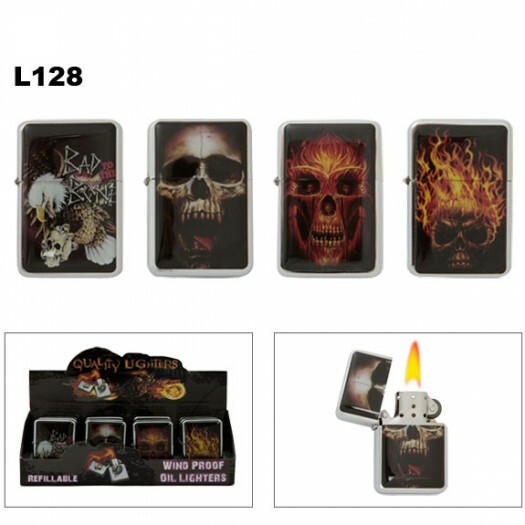 The “L” series lighters are sold by the dozen, and are packaged in convenient display boxes. Brass Oil Lighters “K” Series: Brass lighters are made from the finest raw materials, making these the absolute top of the line series available on the market today, better in fact then other famous name brand lighters. This series is sold individually, and come with an individual tin case for security and safety. *The following information is applicable to both of the aforementioned series. 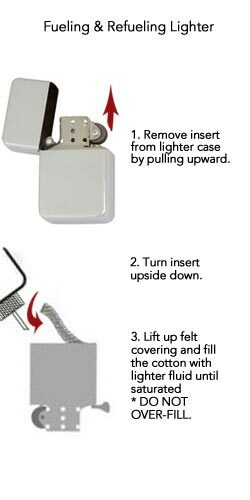 To fill you lighter, simply remove the inner case from the outer case; invert the inner case, lift up the fiber padding and inject lighter fluid into the cotton. It is recommended not to over fill the cotton. 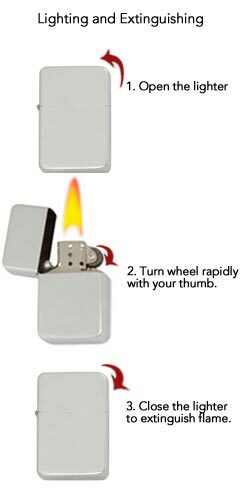 Shown to the left is a helpful diagram illustrating how to ignite a lighter, and to the right are step by step directions to follow when filling your lighter. If you would like a step by step tutorial illustrating how to change your wick, click here. Or you can watch an instructional video below. Oil lighters are a wonderful item to resell. These will sell very well from any location with significant foot traffic, whether from a Mall Kiosk, or a flea market or convenience store. With the ability to buy these at a low wholesale price, the margin for profits is excellent. 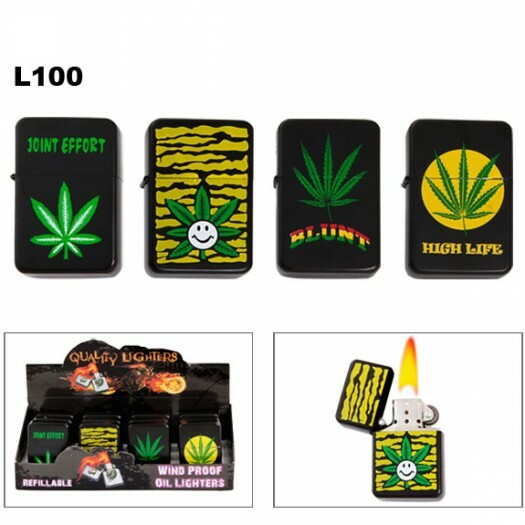 Additionally, with the coming launch of the new "K" series, which are sold individually, you will be able to purchase one lighter, or dozens of lighters, as CTS does not enforce any minimum ordering requirements. Shown below are a few of the top selling lighters currently in stock at CTS.